"The staff is amazing. They go out of their way to make you comfortable." "They work tirelessly to make sure you get the best care." "I would definitely recommend these doctors." "Very easy experience. I'm very happy I went here." "Do your feet a favor and check them out." "Dr. Hall is very good to my mom." With a highly skilled team of licensed podiatrists bringing in over 35 years of experience, you and your loved ones can trust the experienced providers at Newtown Foot and Ankle Specialists to address any foot or ankle problems that may be keeping you from being your best self. In the heart of Newtown in Bucks County, Pennsylvania, this family-owned, easily accessible, and full-service podiatry office prides itself in providing cutting-edge and comprehensive care for children, men and women of all ages in a warm and friendly environment. The dedicated and caring team of Dr. William S. Lynde, DPM, Dr. Michael J. Lynde DPM, and Dr. Amy Hall, DPM, along with other staff members, strives to provide treatment tailored to your individual needs and social circumstances. Patients are treated and made to feel like a family member to develop lifelong, lasting relationships. The team at Newtown Podiatry believes that patient education is central to the healing process and that when a patient understands their condition there is a greater chance of success. They also believe in evidence-based medicine and using the latest medical science to find innovative ways of solving complex problems. The practice’s guiding principle is to empower and educate patients about their conditions so that they can play an active role in their own treatment plans. The team believes in evidence-based medicine to find innovative ways to solve your foot and ankle problems. The team is actively involved in diabetes education that includes diabetes foot care, preventing the development of foot and leg ulcers. The Newtown office is equipped with state-of-the-art equipment to provide diagnostic and treatment facilities under one roof. The podiatric team is affiliated with The Ambulatory Surgery Center at St. Mary Medical Center in Langhorne, Pennsylvania, St. Mary’s Medical Center, and Lower Bucks Hospital in Bristol, Pennsylvania, for outpatient and inpatient surgery as necessary. Dr. Michael Lynde is available at St. Mary’s wound center every Wednesday. Whatever your foot and ankle trouble is, the team works with you to bring you back to full function and freedom from pain as quickly as possible. 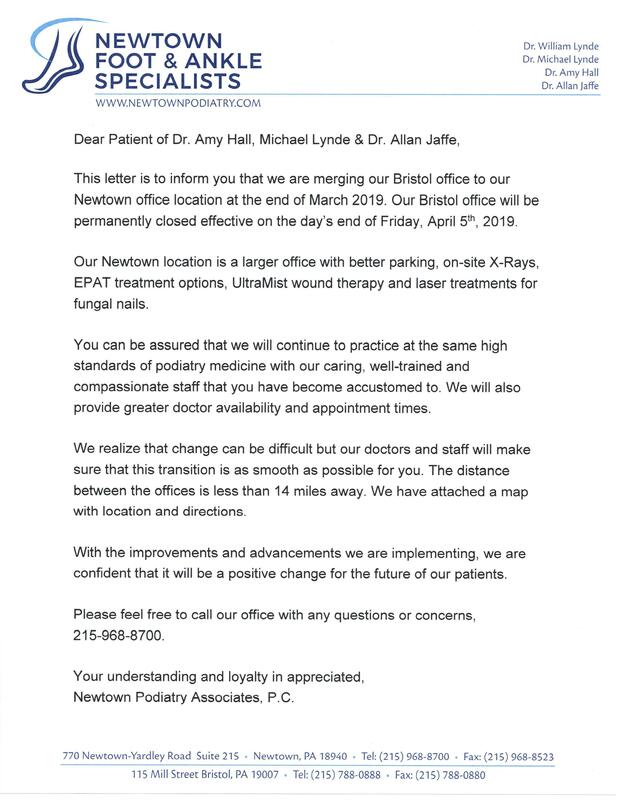 If you’re a Newtown resident and are looking for a foot and ankle specialist, contact the experienced podiatry professionals at Newtown Foot and Ankle Specialists today. We are merging our Bristol office to our Newtown Location at the end of the Month March 2019. Our Bristol office will be permanently closed effective on the days end April 5th, 2019. We are proud to boast we are the only practice with Shockwave Therapy in our area. We are committed to working one-on-one with our patients to help you find the right solution to alleviate or reduce your symptoms. Call today for more information! We accept most commercial insurances and Medicare. Please call for more information.